Le deuxième album de Stephane Ronget, leader de METROPOLITAN JAZZ AFFAIR (MJA). MJA a sorti deux albums et vendus plus de 15 000 albums dans le monde (5000 exs en France). Stephane Ronget qui s’est désormais installé aux états unis, s’est cette fois entouré de musiciens américains, de tout age pour transformer sa fondation en une formidable machine à groover. On retrouve à ses cotés, le jeune batteur Jerome Jennings (qui a joué avec Sonny Rollins, Slide Hampton ou le Lincoln Center Orchestra), le bassiste de José James Chris Smith, ainsi que des musiciens legendaires mais meconnus comme le congéro de Eddie Palmierie Orlando Vega, le flutiste Carlos Jimenez et surtout le saxophoniste- arrangeur Dave schnitter, membre des Jazz messengers dans les 70’s puis du groupe de Freddie Hubbard. Au chant, Stephane a laissé la place au micro à un jeune chanteur prometteur Saunders Sermon, qu’on a déjà reperé aux cotés de Jill Scott, Maxwell ou Jay Z. Le son reste fidèle à celui de label comme Impulse ou CTI, avec un groove moderne inspiré du hip hop mais aussi mâtiné de teintes latines. Cette Fondation new-yorkaise, comme l’ancienne, apprécie les standards peu joués comme la composition culte de Frank Foster ‘Simone’ ou le funky ‘Zap Carnivorous’ du godfather du chant bop Eddie Jefferson . Surtout, elle propose des morceaux originaux ou les suites d’accords savants mais sensibles du compositeur Stéphane Ronget se parent de textures hip-hop et soulignent les solos inspirés d’une équipe soudée. 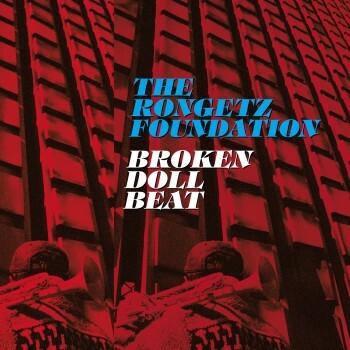 New album from Stéphane Ronget and his Rongetz Foundation, who’ve now setup shop in NYC! Stéphane Ronget’s quest to discover some new beats over in New York put him on the trail of the fantastic conguero from Eddie Palmieri’s band – Orlando Vega. The Nurican music connection is also there in the shape of the bewitching flautist Carlos Jimenez, a follower of Dave Valentin and regular playing partner of Hilton Ruiz and Mike Longo. The Foundation can also draw on the musical experience and harmonic knowledge of a legendary but little-known saxophonist, Jazz Messenger Dave Schnitter, who played sax in Art Blakey’s band from 1974 to 1980. During that time, Dave also made a handful of wonderful albums for the Muse label and took part in one of the most beautiful funky, Afrocentric jazz recordings, Harry Whitaker’s ‘Black Renaissance’, before joining Freddie Hubbard’s band at the beginning of the eighties. Last but not least, Stéphane Ronget’s trumpet playing is still as funky as ever, but he’s handed over the singing on the album’s four vocal tracks to young Saunders Sermon, author of a very good first album, ‘Classic Delight’, and one of the leading trombonists on the hip-hop and soul scene. Saunders is currently recording and on tour with the likes of Jay Z, Maxwell, 50 Cent and Jill Scott. This New York Foundation, like the previous one, favours rarely played classics such as Frank Foster’s cult piece ‘Simone’ or the funky ‘Zap Carnivorous’ by the godfather of bop vocals, Eddie Jefferson. Above all, though, they give us some original tracks where composer Stéphane Ronget’s skilful, delicate chord progressions take on hiphop textures to underscore inspired solos by this closeknit team. This original and off-beat reworking of the sounds of the CTI label, one of the pillars of the contemporary jazz club scene, is a sign of the project’s success (and its initiators’) in the United States and on the international market.